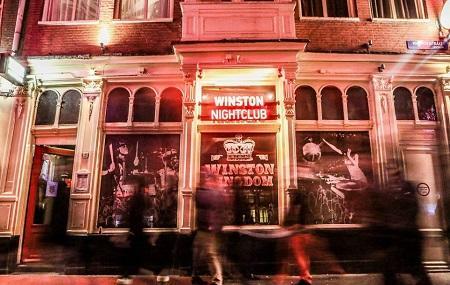 Winston Kingdom Club is located in the centre of the District Red Light at a stone's throw from the Dam square. It was started off as a small club at underground of the art hotel Winston. It was then a popular hang­out place for Amsterdam's artists, poets, and musicians. The club is open every night until late and the programmes organized in this club includes hip-hop, indie rock, punk, electro, bass with the drum, and those are precluded by local as well as international live acts. You will enjoy here parties of crazy students, band competitions, snowboard and skate events and many more. Popular performing artists of Winston Kingdom Club include: Sticky Fingers, Hoff maestro, State Champs, Duff McKagan, and so on. Trams – 1, 2, 5, 13, and 17 and buses – 752, 753 and 758 to stop - Amsterdam, NieuwezijdsKolk travel terminal. Trams – 13, 17 to stop - Amsterdam, Dam light rail station. If you're in the area on Mondays and you're in to dub step/d&b look no further. It might be a small club BUT with a good sound system. Drinks aside from beers can be a bit on the expensive side though. The place can be packed especially later on in the night.